In case you missed it, the Fluval Edge aquarium made its international debut at the Global Pet Expo in Orlando, Florida back in February of this year. Since then, the Edge has started showing up at retailers, first in the UK, then in the US and now in the rest of the world. Most people are excited and intrigued by one of the most unique aspects of the Edge’s design: the glass top. The raised opening of the glass top sits hidden under the canopy and allows for the water level to hide above the viewing area of the tank. This creates a clean and modern floating “water cube” effect devoid of traditional rims. But while the visuals speak for themselves, how about a look under the hood? Fluval aquarium lighting on the Fluval Edge aquarium is very compact. The Edge suports a unique halogen light fixture built into the canopy of the aquarium. Powering two 10 watt halogen light bulbs, the hinged fixture can be lifted out of the way while the user does maintenance on this Fluval Edge Aquarium Set 6-gallon. Also of note, the top of the canopy contains many small holes to allow warm air to escape that is generated while the lights are turned on. The Fluval Edge aquarium set 6-gallon comes equipped with the Fluval Edge filter. The Edge features full 3-stage mechanical, chemical, and biological filtration. Thanks to the attached base/backing/canopy, the Fluval aquarium filter is completely hidden from view but is easily accessible and easy to maintain by removing the top canopy. 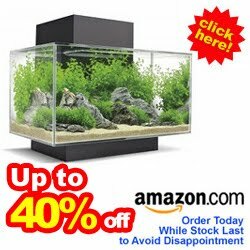 Recommended Stocking and Use: It is extremely important to consider proper use and animal husbandry when considering any small “nano” aquarium. 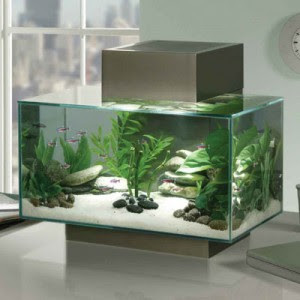 1) Choose appropriate species of fish that will both stay small and be comfortable in a relatively small environment. 2) Don’t overstock! While the Edge filter contains enough biological and chemical filtration to filter an aquarium twice or three times its size, resist the temptation to put too many fish in the tank. Five or six small species should be able to coexist happily in most cases. For more information, visit your local aquatics store or If you like the EDGE, check out the other stunning Fluval nano aquariums: Fluval chi, Fluval Ebi, Fluval Flora, and Spec!